Team Sky have withdrawn Sergio Henao from riding after concerns about his biological passport data resurfaced. A team statement said Henao, 28, had been contacted by cycling's governing body and an anti-doping agency about data between August 2011 and June 2015. The Colombian said he was "beyond disappointed", having missed three months in 2014 over similar concerns. "I know who I am, how hard I have worked and the sacrifices I have made to be where I am today," he added. Henao was voluntarily withdrawn by Team Sky in 2014 while they carried out research into the biological characteristics of riders who live and train at high altitude. They said the results revealed nothing to raise suspicions of wrongdoing. 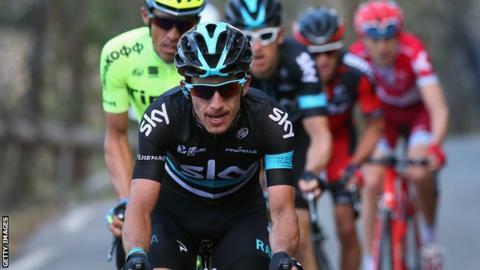 Team Sky stressed Henao had not failed a doping test and had been withdrawn because of the "very obvious distraction to him". "We continue to support Sergio and remain confident in the independent scientific research which was undertaken," the team added. "It is our hope that this can be looked at and resolved quickly by all the relevant authorities so Sergio can start racing again soon." A specialist climber, Henao signed with Team Sky in 2012 and finished in the top 10 in his first Grand Tour, the 2012 Giro d'Italia.